Samsung Galaxy Note 7 is proof of how Samsung started a revolution in the big phones segment. Even as it faces tough competition from the new Nexus series and the HTC 10, the Note 7 leads the way. 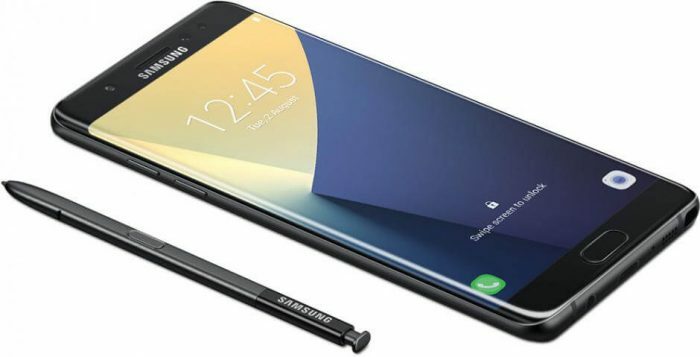 Following the fabulous response that the Galaxy S7 Edge got earlier this year, Samsung’s great form got another lead with the arrival of the Note 7 in India this month, just two weeks after its global launch. The company has done well to drop the dull plastic look of the Galaxy S5 here, giving the Note 7 a metallic look. The Note 7 is a phenomenal device highlighted by its astounding water-resistant design and its slightly curved edge similar to the S7 Edge. Samsung has enhanced its style quotient as well as the ease of productivity through the improvised S-Pen stylus. 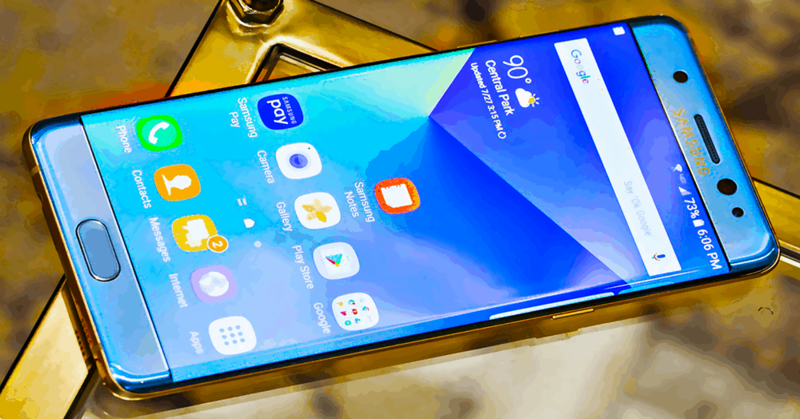 What makes the Note 7 different from its precursors is its dual-curved-edge screen design. Samsung’s play with a curvaceous screen look has now come full circle and it seems to have perfected the curve making it less obvious and steeper, taking away less of the display area. The company’s design team has done an excellent job as the beautifully rounded edge of the front is symmetrically packed into the back of the phone too giving it a tasteful elegance. Even with its large screen size, the phone gives a very comfortable hold and is in fact smaller than both the Nexus 6P and iPhone 6S Plus. 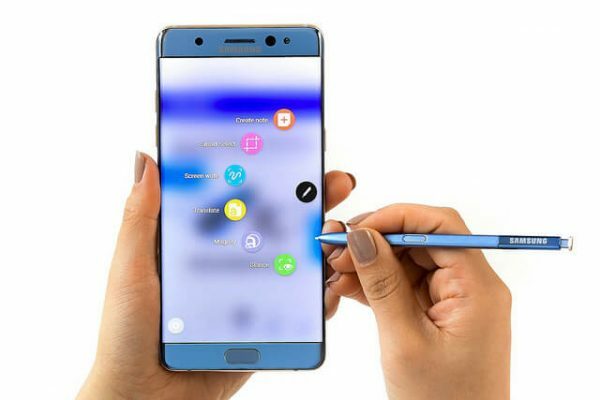 This gives the phone the edge over its dimensional competitors as the Note rolls out all the advantages of a large screen without actually having to use both hands. It is more ergonomically perfected and aesthetically appealing than most of its pals. Also the company has finally realized the worth of a true metallic smartphone. With its straight-fit design and sharp rectangular look, the phone appeals more as a business device. The phone’s delicateness is well-protected against clumsy falls, with the break resistant Gorilla Glass 5 that covers both the front and the back. The phablet has done well in drop tests, surviving falls from up to 1.6 meters onto rock hard surfaces 80% of the times. However, the phone crumbled in the scratch tests in the sense that the fingerprint sensors conked off when scratched. However, anything glassy attracts a lot of smudges and fingerprints, and that is just the case with the Note 7. The camera bump has been rolled into the surface of the back, imparting a flawless smooth finish to the phone. A big plus for the Note 7 is that it can survive immersion in water for up to 30 minutes. The huge 5.7-inch screen on the Note 7 is by far the best in the market at present. However, it is not the screen size that matters. It is the quality of display, and the Note 7 has Samsung bringing you the best of it. The AMOLED Quad HD screen brings everything to life with perfect brightness, contrast and brightness. Samsung has not increased the screen resolution as speculated by adding High Dynamic Range (HDR); instead it went finer on the pixel scale with 518ppi, which makes it virtually impossible to spot the grains. The Note 7 not only supports HDR content streaming but also has a built-in Video enhancer mode that brings supported apps such as Netflix, YouTube, and Amazon Prime into life. Even though it may not give you the best of the viewing angles, the colors are lively and the images crisp. White does not appear muddy and the brightness is perfect even under the sun. Even with such a large display, the phone looks surprisingly compact. The curved display adds an extra appeal to the onscreen multimedia, even though it does not have any functional essentiality. The curved edges offer extra operational ease with options to swipe into apps, weather information and take a quick dive into the contacts. Another special touch Samsung has given to the Note 7 is keeping the display always on for a quick reference into onscreen displays like time, date and other basic essentials, without actually having to push an access button every time. The AMOLED technology makes sure your battery does not get drained due to this. However, this feature can be turned off if it bothers you. For the general user, the Samsung Galaxy Note 7 is above average with an octa-core 2.3-GHz chipset and a 4-GB RAM. It has the same processor as that in the Galaxy S7. The phone is designed to handle everything on a daily task card, and more. It has a good multi-tasking ability between apps and doesn’t heat up even while playing graphic-intensive videos and games. However, the Note 7 comes in only second to iPhone 6S in speed test. It has a neat search bar that comes in handy when in a hurry to find an app. The processor scored a good 2118 in the single-core Geekbench 3 test and 5924 in the multi-core test, which matches up to the expectations from the flagship phones in the market. The nagging software issues found in the older Galaxy versions stand rectified with the Note 7. The phone scored a 129729 in the AnTuTu 6 test at par with the Galaxy S7 Edge and its graphics performance came in at a prestigious 2139 3DMark Sling Shot score. The battery performance falls a little short of what is promised by the company in the battery drain test but is otherwise excellent for daily use. The company offers 64GB UFS 2.0 internal memory with a MicroSD card slot that can accommodate 256GB more of space. The music quality and voice clarity on speaker has always been a little below the benchmark in Samsung phones and it continues to be so even in the Note 7. Even though the speaker seems fine on first impression, it doesn’t match up to other contemporaries. The quality of voice calls is brilliant with the microphone easily cancelling out any background noise. The phone features 4G/LTE signal. The company has really worked on getting its software bunch together. All of the S-pen related apps are grouped up into a head called Samsung Notes, which is a slight take on Apple’s Notes app. Samsung phones, especially the Galaxy series is known for the S-pen Stylus. 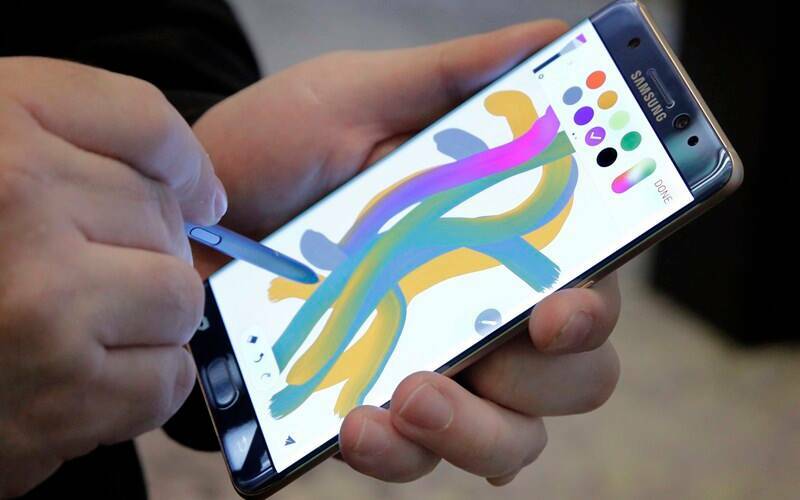 The Galaxy Note 7 has managed well in carefully attributing the stylus into its essentiality. The S-Pen is a thin plastic stick with a click button top and another button at its midpoint. It fits neatly into the slot provided and is easy to slip in and out of the phone. It doesn’t need independent charging or pairing and is easy to work with. The earlier version of the stylus had a lot of issues with the Samsung has done a good job in improving the S-pen in terms of precision, fine-tuning the tip and increased pressure sensing. Even though the screen is small for any work of fine art with the S-pen, the stylus maneuvers smoothly into notes and casual drawings. The stylus glides smoothly along the curved edges too. However, Samsung is yet to master the Stylus performance even after delivering the seventh version. The stylus somewhat slows you down and makes you want to use your fingers instead. Frequent errors in the handwriting mode are also a turnoff. The need for accessing onscreen buttons points out that the S-pen could have been more flawless. One plus about the stylus is that it too is water resistant and can survive after being in 2.5 feet of water for almost 28 minutes. It is time to do away with patterns and old-fashioned passcodes. Iris recognition is probably the most revolutionary feature that any smartphone has ever featured. Samsung first featured this futuristic technology in its Galaxy Tab IRIS, however, it wasn’t made for the commercial market. The Galaxy Note can be unlocked using iris recognition in a flash of time. This new biometric security feature is aimed at giving smartphone users something beyond fingerprint locks. The setup is simple; users have to just turn the phone unlock mode to iris scanning option in the security settings and then follow instructions to activate and personalize this feature. However, the scanner runs into problems if the user wears spectacles as reflection from the glasses tends to interfere with the scan software. Maintaining correct distance is essential for the scanner to function properly. Thus, Samsung still needs to perfect this technology for a flawless run. 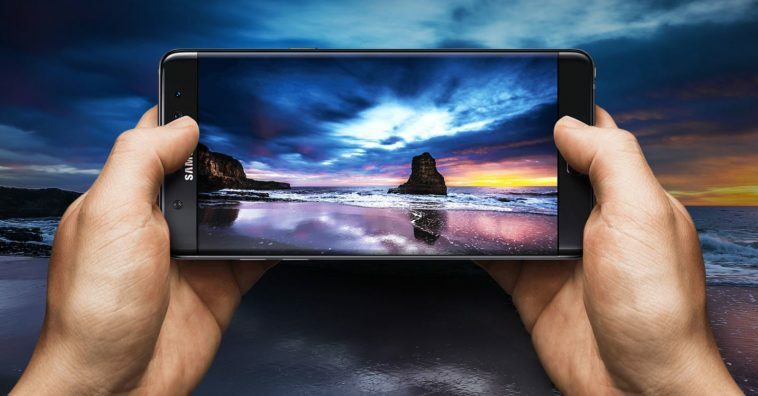 The Samsung Galaxy Note 7 comes with the same amazing 12MP rear camera as seen in the Galaxy S7 Edge. It is by far the best in the market- at par with Apple’s current market offering. The Note 7 captures clear and bright photos even in low-light mode. The camera is well supported by software that reduces load time and an app that is much less complicated than its previous versions. The simplified software makes the camera easy to use. The app allows for a manual mode of operation that lets you adjust the shutter speed, color balance, focus, and ISO among other things, adding more power to the top class hardware. Other features that the app offers are panorama, slow motion, time-lapse, etc. Visual shot is also packed into the app, which is a feature that allows panorama shots around a pivot. The 12-MP camera is consistent on performance; colors are vibrant and details are clear. One issue that many face with Samsung’s camera software is that it adds more than the desired touch of sharpness to the shots, leading to rough edged images. The 12-MP rear camera allows you to shoot Ultra HD 4K movies. However, ultra HD videos even as short as 20 seconds can take up a huge volume of the phone’s memory. The 5-MP front camera is carried over from Samsung’s other Galaxy series phones and has been kept untouched in terms of upgrade. Samsung Galaxy Note 7 is definitely a class apart with its brilliant performance and stylish finish. New bonus features like a water-resistant body and the iris scanner are truly appealing in a market flooded with a variety of smartphones. Battery life is impressive especially considering such a huge HD display. Even though the phone has received much criticism for the ridiculously high price, Samsung Galaxy Note 7 is definitely worth every bit of the hype if you are a loyal Samsung customer.